I have discovered plenty of winter and extreme sports while living in Finland. I believe the Finnish weather to be perfect for focusing on experiencing different sports, especially the winter ones. Many of interesting activities are organized by the ESN, many others are included in the Syketta membership and others are presented by keeping a spontaneous and adventurous mind. Cross-country skiing is a must in winter. You can even get to Uni while skiing, how cool is that? Buying a set of skis and poles isn’t expensive at all, you can get them from leaving students or second hand shops. Syketta is a great place to meet new people who share your interests and passions. The membership will allow you to keep yourself busy every day and take on every sport you can possibly think of. Some special emphasis should be given to the proper Finnish sports such as floor-ball or Finnish baseball. I have found a new passion while in Finland, and that is climbing. I have started indoor climbing in Arena with some friends and created many more. The climbing team is nothing but generous with their knowledge and expertise, they are more than happy to take on new students and even take them to national parks for outdoor climbing. Finding climbing was one of the most relevant findings I have ever found. 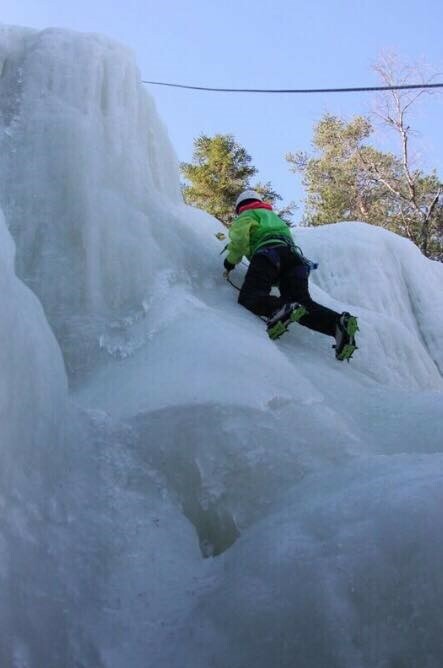 I even climbed a frozen waterfall, because of course, Finnish weather. My advice is for you to just try, try everything; you have the time and the access to do so, releasing endorphins and making new friends.